More than 70 people, representing insurers, manufacturers and specifiers, attended this seminar at BRE on 12 March. They debated the correct specification, supply and use of scaffold cladding and temporary protective covering materials on construction sites, and the role of LPCB standards LPS 1207 and LPS 1215. The presentations are available here. How effective are Xenon and LED VAD's? Xenon and LED visual alarm devices (VADs), used to warn deaf and hard of hearing people of fire, has been investigated in a recently completed research project. A video summarising the project can be seen here, and a briefing paper here. LPS 1301- ‘Requirements for the approval of Sprinkler Installers in the UK and Republic of Ireland for Residential and Domestic Sprinkler systems’. Following the introduction of engineered fire protection in the late 19th century, insurance companies introduced the concept of third-party certification for sprinkler systems. This was later extended to include installers and other systems and equipment. In the past decade there has been a significant increase in the use of sprinkler systems to protect life in residential and domestic premises in the UK. This was a result of experience in the United States where residential sprinklers were seen to make a significant contribution to reducing the loss of life from fire. In addition to the traditional sprinkler installation companies, a range of other organisations started to enter the market to provide the smaller domestic and residential systems. It was determined that a separate scheme for installation of these systems was necessary. The standard is LPS 1301- ‘Requirements for the approval of Sprinkler Installers in the UK and Republic of Ireland for Residential and Domestic Sprinkler systems’. LPS 1301 is principally aimed at ensuring life safety in residential and domestic premises but also affords protection for all property and the environment. It uses the same technical requirements for acceptable systems as those laid out in BS 9251. – To ensure reliable operation in the event of fire. In keeping with other LPS schemes, LPS 1301 provides independent third-party certification that systems and the people who design, install and maintain them meet and continue to meet appropriate standards. LPS 1301 ensures that everybody involved in commissioning and supplying the system, together with the end client, has confidence and assurance that the product meets the standard. Ultramist Ltd is the first company to achieve approval to LPS 1301. The countdown to CE marking of cable and fire door products under the requirements of the Construction Products Regulation (CPR) has now begun, following citation of the product standards in the Official Journal (OJ) of the European Union on 10 July 2015. The product standard EN 50575 for power, control and communication cables was cited in the OJ on 10 July 2015, marking the start of CE marking being possible for these products from 1 December 2015. By 1 December 2016, CE marking will become mandatory for all such products placed on the market in Europe. The product standard EN 16034 for fire door sets was similarly cited by the OJ on 10 July, with CE marking being possible from 1 December 2015. The standard provides the requirements against which the fire resisting and/or smoke control characteristics of fire doors are tested, and includes the measurement of performance against the following characteristics: fire resistance, smoke control, self-closing and the operation of hold open devices (ability to release). By 1 December 2018, CE marking will become mandatory. From now, BRE Global is able to accept both cables and fire doorsets for testing in accordance with EN 50575 and EN 16034 respectively, in support of manufacturers aiming to CE mark their products and demonstrate regulatory compliance. "The deadlines for these products to achieve CE marking should give manufacturers adequate time to complete the required testing and procedures," says Debbie Smith, Director of Fire Sciences at BRE Global, "but the sooner manufacturers commit and get their work programmes underway, the better. Talking to the testing and certification experts at BRE Global would be a valuable first step, likely to save time and keep unnecessary costs down. “As a Notified Body for a wide range of construction products covered by the CPR, and a UKAS accredited laboratory for conducting the tests needed to demonstrate compliance," says Smith, "BRE Global is able to provide manufacturers of these products with a professional and efficient service in support of their CE marking requirements." BREEAM the environmental assessment method for buildings, which sets the standard for best practice in sustainable design and has become the de-facto measure of a building’s environmental performance. Kamil Hamid, LPCB country Manager, India recently attended the India Fire & Security Yatra event in Kolkata. This was hosted by the Fire & Security Association of India (FSAI) - Kolkata Chapter. The Chief Guest was Mr Javed Ahmed Khan, Minister-Fire Services, Civil Defence & Disaster Management, Govt. of West Bengal. Mr D K Shami, Fire Advisor, Ministry of Home Affairs, Govt. of India gave the Key Note address on ”Fire Safety in Smart Cities”. Kamil took part in the conference and exhibition, raising the profile and promoting the value of LPCB certification. Pictured right is Ian Stewart of BRE opening the course at BRE, Watford on 24 March. This course is being jointly presented by BRE and the Door and Hardware Federation. It is aimed at anybody undertaking inspections of timber doors, steel doors and steel roller shutters, and covers relevant standards and regulations (including CE marking), the different types of doors, critical components and what defects to look out for. LPCB and the South African Bureau of Standards signed an agreement for the use, in the South African market, of LPS 1263 for assessing and certificating the performance of grease filters in commercial kitchen extract systems. See here for LPS 1263 approved products. Products used to protect construction sites from accidental damage, dirt, dust and other hazards, need not add significantly to the fire risk – as a new LPCB-approved floor protection product demonstrates. During the construction of new buildings and renovation of existing buildings, it is common to use protective sheeting made from plastic or similar materials to provide protection against damage, dirt, dust and other materials produced by work in adjacent areas. 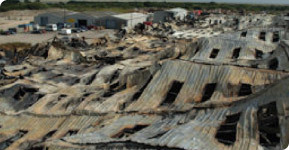 If the material used complies with LPS 1207, Fire requirements for protective covering materials, it will not add significantly to the fire risk. The standard was originally published in 1994 and the number of approved products now stands at more than 70. See here for a full list of LPS 1207 approved products.